Bright and colorful as a spring morning, our iris and tulip bouquet will add a burst of color to any room. 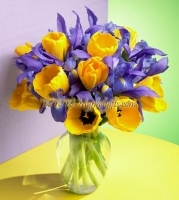 The vivid colors of 6 yellow tulips and 6 midnight iris make a delightful arrangement. These graceful blooms are shipped in the budding stage ready.